The Wheels to Woonerfs event on Tuesday, September 16,2014 was a free event hosted by the Seattle Architecture Foundation for the 2014 Seattle Design Festival: Design in Motion. It consisted of an exclusive behind the scenes tour of the King Street Station restoration project, an AIA National Award recipient, followed by a panel discussion at the Klondike Musuem presenting various facets of urban design and transportation planning. The tour was led by Tim Williams of ZGF, project architect for the King Street Station restoration. 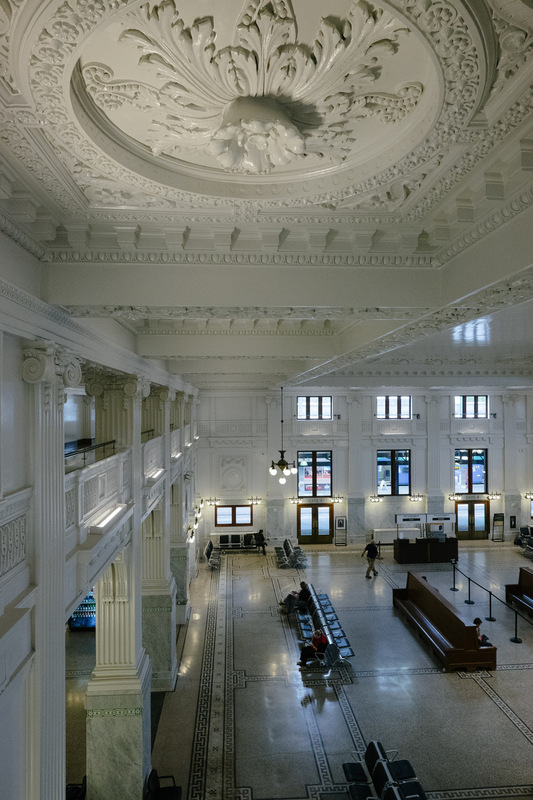 Immaculately redone, the station is an exemplary case of a historic architecture preservation project. The most exciting part of the tour was the behind the scenes access to the two-upper stories which were left unfinished for a future office tenant. The space is still available for rent if you know of anyone interested! Our panelists were carefully chosen to span a wide array of expertise on transportation design and was energetically moderated by Lyle Bicknell (City of Seattle, DPD). Steven Shain (City of Seattle, DPD) presented the upcoming plans for the Link extension, its opportunities and challenges and what to look forward to in the upcoming few years. It was really exciting to hear about projects that we are contributing to in such a public and positive way. Steven was followed by Tim Williams (ZGF Architects) who segwayed, pun intended, into a presentation on bicycle infrastructure, a continued interest for our Schemata bikers. He presented several bike-related projects in Seattle including the protected bike lane on 2nd ave and the bike-share program 'Pronto!' slated for official release this fall. Tim ended with a reminder that we are nowhere near as bike-savvy as the Dutch and a call-to-action to aspire to their infrastructure capacity. Kris Snyder (Hewitt) then presented three Seattle woonerf (shared street) projects explaining the design concepts behind the urban intervention, the challenges and the outcomes. He was very optimistic about the direction the Department of Transportation was taking in terms of being more open about new design solutions for transportation planning. We finished off with Lesley Bain (Framework) who questioned the urban design of downtown streets, presenting a "traveling lounge" pilot project and opening up with the question of what will happen to the buses when the downtown tunnel will be exclusively for the Link. Her proposed solution imagined a system with a connected double-core (at King Street Station and Seattle Center) from which bus routes could array from the hubs. From left: Lyle Bicknell, Lesley Bain, Kris Snyder, Tim William, Steven Shain. The importance of language: let's not vilify car users, but rather empower car-owners to believe that alternative transportation solutions are better. There is an incredible amount of growth projected for Seattle in the upcoming years from industry giants moving into the city like Amazon and Weyerhauser. How will we be able to capture that increase in population both in terms of housing and transportation capacity? And what happens if Amazon decides to leave the downtown core? Pronto! bike-sharing to be available in Fall 2014 -- just around the corner! The benefits of seeing the city and to be seen zipping past traffic in above ground transit versus underground subway systems. Factors influencing the success of an outdoor mini-lounge (or parklet? ): agency of adjacent business owners, foot traffic, vehicular traffic, movable furniture vs. fixed furniture. Weaving the street right of way to slow down car traffic in woonerf design. The learning transition time it takes for people to get used to new design features can lead to some very funny situations. After mulling about it for the past week, my answer to Lyle's question of what I would Iove to see tomorrow in Seattle transporation infrastructure...a more efficient public transit connection between Ballard and Capitol Hill...please! This event was my first event as co-chair of the Design in Depth committee and I was extremely pleased it was such a smooth-running success! Special thanks goes out to two new but extremely resourceful volunteers, Sandy Chalk and Dan Fernandez for putting together such a terrific group of panelists; Stacy Segal for her dedicated work as SAF executive director and to all the other SAF volunteers who helped out at the event, including our engaging panelists! Please click here for more photos from the event by volunteer photographer Letao Tao. Today was the grand re-opening of Holiday Apartments, an affordable housing project owned/managed by Capitol Hill Housing (CHH).